Squam Lake, NH's second largest lake.. Squam lake was originally called Keeseenunknipee, which meant "the goose lake in the highlands". The lake then took on the name Casumpa and then Asquam and finally Squam. Squam Lake, NH's second largest lake, is located in the central part of the state, south of the White Mountains It borders on Grafton, Carroll, and Belknap Counties. Big Squam drains into Little Squam Lake, then into the Squam River eventually into the Pemigewasset River. Squam enjoys some of the most unspoiled natural beauty of all New Hampshire lakes The types of property vary from secluded cottage getaways to classic turn of the century compounds, but all enjoy the same rustic and natural outlook making it a popular retreat for visitors and lakefront owners. Squam Lake lakefront properties enjoy access to and views of the incredible 65 miles of shoreline that were made famous by the film On Golden Pond starring Jane Fonda, Henry Fonda, and Katharine Hepburn filmed in 1981. Unspoiled coves are ideal for fishing and the lake is also a breeding ground and nesting site for the Common Loon. 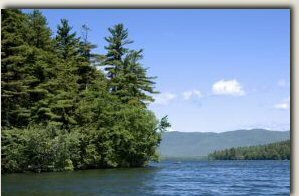 67 islands dot Squam Lake and much of the region has been claimed and protected as conservation land. This, in part, has led to Squam Lake being one of the less populated of the New Hampshire lakes despite being the second largest lake. As well as helping preserve the natural beauty of the lake, this has also made Squam Lake real estate some of the most highly sought after of all NH Lake properties. With 10 miles of open waterway shared between Big Squam Lake and Little Squam Lake it is little surprise that New Hampshire lake properties situated in the area often enjoy private beaches, docks, and waterfront mountain views. Whether you have your own boat or you enjoy the tranquility that is offered by lakeside living, Squam Lake is the ideal locale. Squam Lake has seasonal cottages, condo's to lakefront estates that dot the shoreline. Holderness is the largest of the towns situated on Squam Lake with other settlements including Sandwich and Moultonborough as well as Center Harbor. Appealing NH lake real estate can be found throughout these towns offering something for every individual or family. For additional information on Squam Lake homes ( Price Range $600,000 up ) call Lady of the Lake Realty at 1-888-737-5550 or e-mail at info@nhlakesrealty.com or visit our website to view similar lake homes in New Hampshire including Newfound, Sunapee,Wentworth, Merrymeeting and Winnipesaukee at www.nhlakesrealty.com or www.lakeorskirealestate.com Contact us today!